Charlottesville, VA & London - Sept. 26, 2018 --- A new fintech partnership between Yellowfin and ChartIQ is bringing advanced analytics and BI data to end users on the desktop, faster. The Yellowfin and Finsemble integration lets users dive into the data that’s most relevant to them and then immediately puts those reports into production on their desktop. Users can create and share reports internally without any involvement from IT or teams of analysts. Over the last year, several tier-one firms have shown significant interest in leveraging new technology that upgrades the user experience and improves levels of efficiency by providing the best apps for the job. 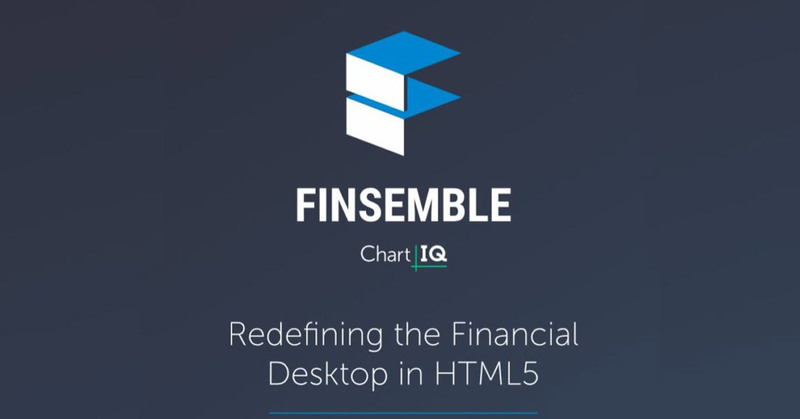 Finsemble’s application-integration platform allows firms to preserve legacy applications while simultaneously adding new applications, like Yellowfin, into the financial workstation. This partnership is redefining the financial desktop for industry power users. Yellowfin provides a Business Intelligence (BI) and analytics platform aimed at solving real enterprise analytics challenges that helps financial professionals understand not only what happened, but why. Together, Yellowfin and ChartIQ deliver advanced data visualizations that convey intelligent business insights that are quickly and easily accessed, and that can be customized for any banking community. Yellowfin is a premier partner of the Finsemble Ecosystem. Users of the Yellowfin and Finsemble integration can benefit in a number of ways. It’s easy to connect into entitlement systems and deliver up a set of credentials for each individual user. Users can launch individual reports, create and customize reports, and filter reports to match their market needs. Multiple reports can be viewed at once, saved and restored as an individual workspace. Business intelligence reports can be easily incorporated and shared into the desktop of other users within the organization. When business intelligence is organized and displayed in a format that is easy to digest, easy to control, and easy to use - users are in control. brokerages, trading platforms, and financial portals worldwide. Using ChartIQ technology, large organizations are able to assemble and integrate different types of applications in hours instead of months. With over 250+ global customers, ChartIQ is one of the fastest growing companies in fintech and serves many of the largest names in finance, including Factset, Fidessa, Nasdaq, and eToro to name a few. For more information, visit chartiq.com. Yellowfin provides a Business Intelligence (BI) and analytics platform aimed at solving real enterprise analytics challenges and helping business people understand not only what happened, but why. Founded in 2003 in response to the complexity and costs associated with implementing and using traditional BI tools, Yellowfin is an intuitive, 100 percent web-based reporting and analytics platform. More than 25,000 organizations and more than three million end users across 75 countries use Yellowfin every day.